Mr Dreamy can rarely be convinced to wear vintage styles, but I still like collecting vintage mens patterns, partly because they are useful for clients, partly because I want to teach classes on vintage menswear, and partly out of a hope that someday he will convert and become as enamored of vintage fashions as I am. 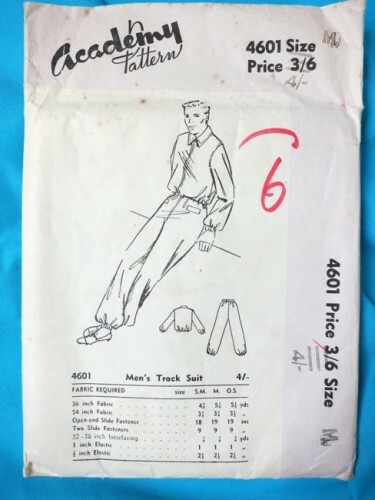 A lot of my vintage men’s patterns are from the 1970s, because the 70s was a great period for men’s patterns – incredibly well written and drafted, and easy to alter to other periods. I do have some earlier patterns though, so I’ll focus on those today. 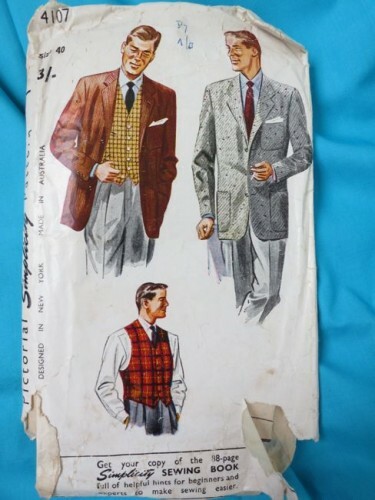 Like Butterick 3999, the only menwear pattern that I inherited from my Grandma. I can just imagine Grandpa wearing this shirt. I don’t think he played golf though. Academy 2174 is the (slightly earlier, or well behind the times) New Zealand version of the sports shirt. I love how dapper the men are, in a sort of really ugly Clark Gable way. 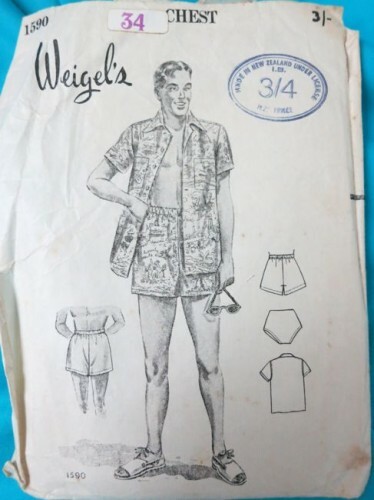 Keeping things casual is Weigel’s 1590, with beach shorts, summer shirt, and bathers. Yep, that pattern is never going to entice Mr D! If that is too much skin to show, how about Academy 4601, with its men’s track suit? I wonder if this pattern is in any way linked to the popularity of running in New Zealand in the ’50s and ’60s, when NZ was top of the world in running? If the beach and running aren’t your thing, how about the woods? 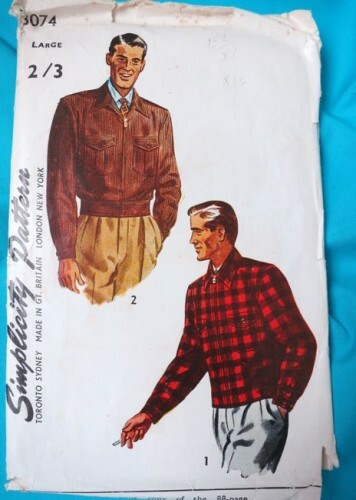 Simplicity 3074 offers both what it blandly describes as a ‘men’s jacket’ (I’d call it a bomber jacket) and a lumberjack jacket! 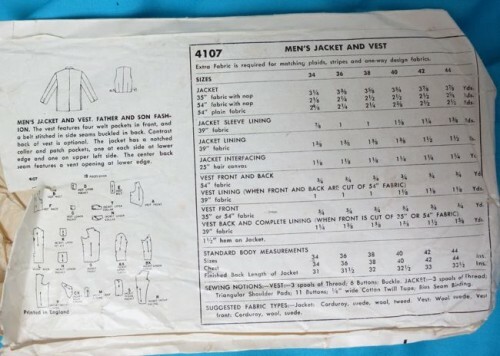 I also have a more formal men’s jacket pattern from the ’50s, in the form of Simplicity 4107, which also has the option of a snazzy vest. Oh, and it’s a ‘Father and Son Fashion’, so you can make your boy one to match! 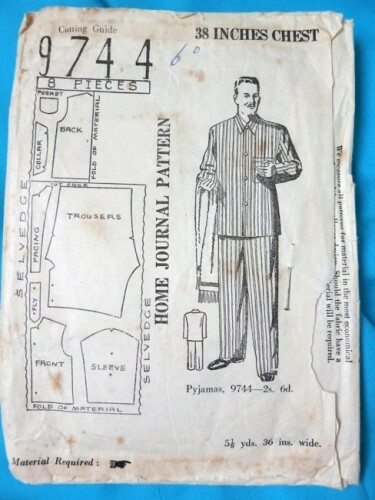 I love Home Journal 9744, mostly because the handsome fellow on the cover with his turkish towel reminds me off a cross between Inspector Poirot and Nick Charles. You just know that someone has been murdered just off the edge of the pattern, and he’s off to solve the mystery! The models on Academy 2042 aren’t nearly as worldly, nor are their towels as posh. The toothbrush is a nice touch though! 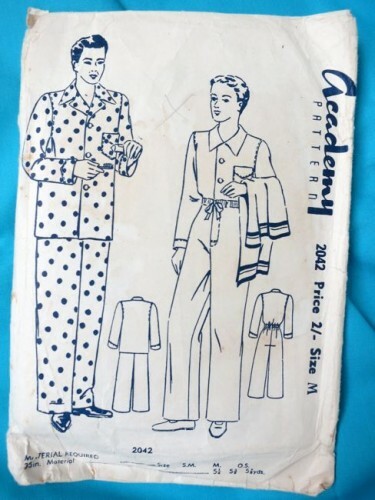 A fun little quirk of this pattern is that no-where on the pattern envelope, or in the directions, does it use the word pajamas or pyjamas – the directions refer to ‘top’ and ‘trousers’ and the envelope is completely silent as to what is being sewn. The pattern pieces themselves are unmarked. That’s one was to avoid the question! I have always, and will always, spell pyjamas pyjamas. My autocorrect agrees with me. I just gave away a bunch of men’s patterns, I wish I’d known you were into them! Although they were pretty hideous. 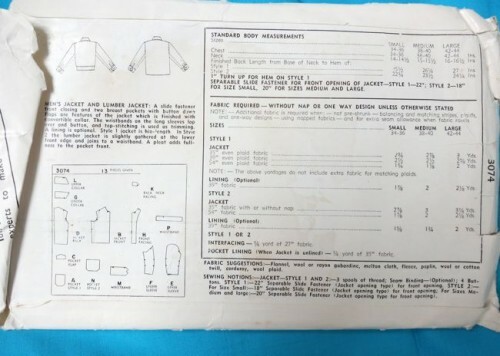 I treasure my 1970s mens patterns (mostly, not counting the beige mock turtlenecks though!) It’s the only time men’s fashion had both class and flair. I have the lumberjack jacket pattern, I hope to make it someday as it would make my carpenter/wood-chopping boyfriend a good work shirt. 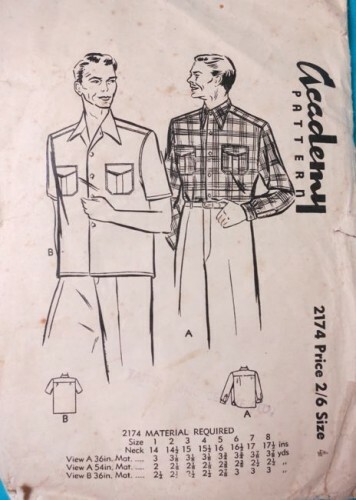 I should pass on my 1940s men’s pants pattern. It has a dalmatian on the cover, too. Its a 38″ waist so it will lay around unused I’m afraid. Me and my sister agree. I’ve never seen pyjamas spelled with an ‘a’. Did you know it derives from Indian English (as in sub-continent India)? In which context the y is quite logical. Learned this from fascinating Melvyn Bragg doco on History of English. Thanks for sharing the men’s patterns – I want that red plaid version! I see the problem. They lack excitement. Useful and worthy. Earlier men’s fashions were often a lot more exciting. Will Mr D. wear a nice forties suit? Or even evening dress? Hadn’t even noticed that pyjamas had another spelling. I learn something new every day from your site. Men’s patterns definatly not very exciting. I always spell pyjamas with a “y”. I must agree with you, Karen, about menswear patterns being boring. 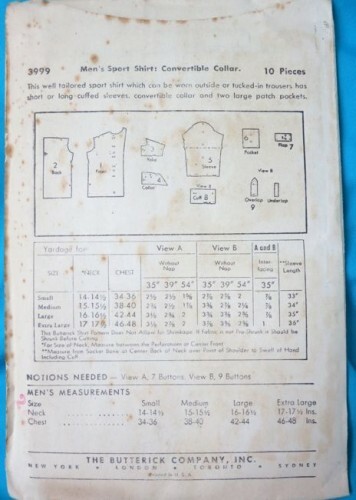 The post was interesting, but I expect that most women were always quite bored by sewing menswear! Wow, Simplicity 3074 was a pattern I saw once on eBay, but could not afford, but just captured a picture and hoped to see it again. What a nice collection. I have not met anyone before who collects them..men’s patterns that is-lol. I will keep an eye open for you now at my local thrift haunts. Thanks for sharing. etsy.comMaybe the pajama spelling is an American variant? We use pyjama in Canada. Is there a word for this style of shirt? I know you do! Mr D actually owns a beautiful ’70s suit, but we both prefer the more toned-down ’70s style – the bits that were classic and timeless. These are great patterns. I love the jacket and the sports shirt. That’s interesting. I usually don’t focus on vintage men’s clothes much, and I don’t care for a lot of mid-century clothes because they all seem so boxy. The seventies are cool though! 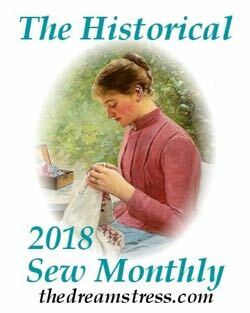 I guess I wouldn’t mind dressing with a sort of “vintage throwback,” but women’s wear is so much more interesting from the past century than men’s–I think that’s why so many women have embraced that trend. Menswear has experienced a sad decline in interest ever since the end of the 18th century! And every time it got sort of interesting after that it went dreadfully wrong (multiple patterns of plaid in one suit! Zoot suits! Pants that show your boxers and hang below your knees!). I think we’re actually going through a reasonably good period, all things considered. I never thought about my spelling of pyjamas until I googled ‘striped pyjamas’ and ‘spotted pyjamas’ about 6 months ago to get inspiration, and came up with zilch (well, very little) that I realised that online stores all used the ‘A’ spelling. Yeah, those men aren’t quite what it’s at! Of course, Frankie dear never did it for me – he was as ugly as Bogart, but without the charm. I’m a Gene Kelly girl. I love how the illustrations sort of look like old comics characters – I started imagining storylines / situations for them, much like you did. The Poirot man and storyline is probably my favourite. 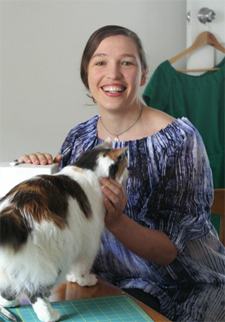 And I think you’re right about seamstresses not being so afraid to sew pyjamas: it’s even simpler than a shirt (without all those pesky plackets and things). 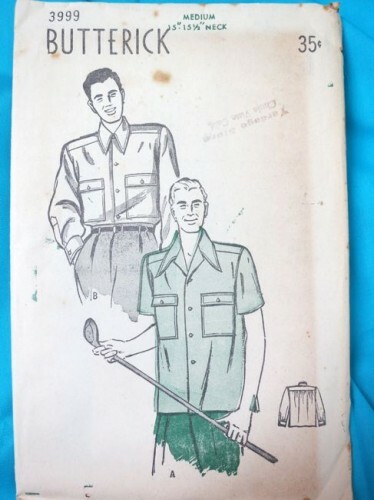 In the old German sewing magazines that I have on long-term loan (ahem…), the menswear is also usually restricted to boys’ patterns, underwear / sleepwear and accessories… It’s rather funny, because you see lots of women’s coats all the same – I wonder what exactly that says about quality/style/social-standing/whatever demands/requirements gender-wise. 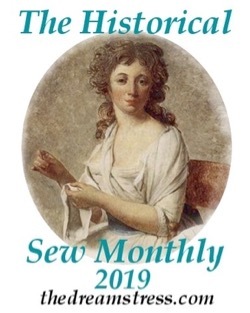 Or could it be just the same thing sewing bloggers are experiencing nowadays: the seamstress being more willing to sew for herself? And: I think the class and flair of 1970s men’s fashions are best demonstrated on the fact that they were present even behind the Iron Curtain, where fashions were generally blander at the time. 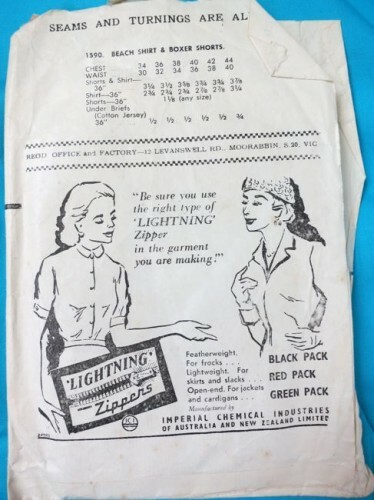 I think I would not mind seeing some of your patterns from the era. 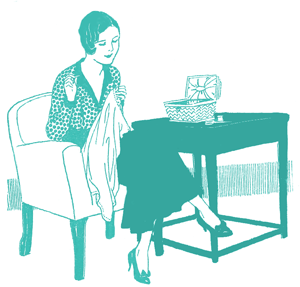 It certainly is a lot easier to sew for yourself than someone else, and men can be weirdly picky. Eventually I’ll post all my patterns, but I’m working from earliest up at this point. There were, of course, many bland, conforming styles to go with conforming people; but 70s fashions somehow made working around that, in the confines of what was available, possible. Somehow, completely ordinary people in completely ordinary clothes could look quite stylish. There are, of course, also “horror” stories about men with long hair being persecuted, etc. That’s not exactly what I wanted to talk about – I was thinking about people who did not want to be conforming, but were not exactly shaped to be non-conform either.